You'll meet your friendly crew who will take you through the process of preparing the locomotive and putting together a typical freight train. Once all safety checks are complete, you'll depart for Castlemaine and get to experience controlling the train both descending and climbing the steep hills of the Victorian Goldfields Railway. After turning the locomotive on Castlemaine turntable, you'll enjoy a relaxing lunch with the crew before changing drivers for the return journey to to Maldon. This Experience is for Everyone! The Steam Driver Experience is for those who enjoy the sights and sounds of a steam locomotive. 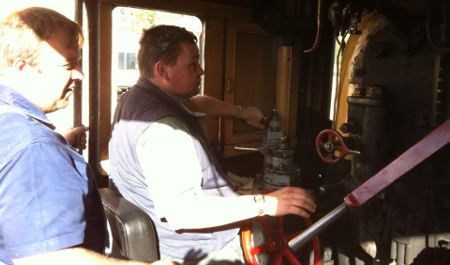 You need no previous railway knowledge or experience - we will teach you the basics of driving a steam locomotive. If you are over 18 and of reasonable health and fitness - this experience is for you. You will drive either a J class or K Class Steam Locomotive. The locomotive you will be driving is one of our regular service engines. Maintenance requirements may determine which locomotive is available for use on your experience. The Steam Driver Experience can be enjoyed on any day when we are not running passenger services, i.e not on Sundays, Wednesdays, Saturdays during School Holidays or on Special Event Weekends. Bookings may be limited during the summer fire danger period months (December - March). The day starts at 8.30 am and is a full day experience. 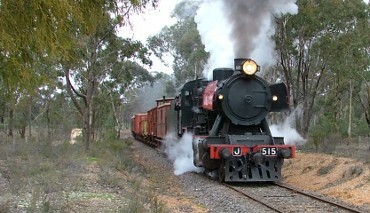 You will drive the steam locomotive with its goods train over about 8km of the Maldon and Castlemaine journey, each group members drives about 8km. By late afternoon you will have received your Certificate of Achievement, be tired, dirty and very satisfied with your days efforts. "I can't say too much about your staff - they were wonderful. Ian and John were very friendly, professional in their knowledge and very patient with me. I was thrilled to be able to assist in most aspects of the locomotive's operation, including lighting the boiler, oiling, mechanical inspections, pressure and safety checks etc. Driving the engine was simply sensational! I was amazed how much work the driver has to do so that the locomotive is kept running correctly. But it was great fun!" "I would like to congratulate your Society on the concept of the Train Driver Experience. I thoroughly enjoyed my day. This concept allows us avid followers of the steam era a chance to live out some of our dreams, when we stand on the footplate of locos on open days and wish we could just pull on the regulator and just feel the energy of it moving from the platform. Thanks to your Society I have been able to fulfill that dream and it was a very fulfilling experience. I would like my thanks to go to the train crew of Ian, Paul and David for a day that I will not forget for a long time. Their knowledge and experience and their faith and confidence in me all helped to make the day very enjoyable. Once again,congratulations and a very big THANK YOU.